Manchester University faculty members make a difference inside and outside of the classroom, on-campus and in the community. The University is recognizing three of its liberal arts faculty for distinguished teaching, scholarship and service. All teach on the North Manchester campus. 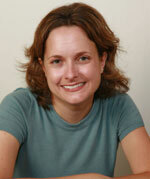 Stacy Erickson, associate professor of English, received the award for service. Last spring break she volunteered with the campus chapter of Habitat for Humanity. She also led a seminar for first-year students as well as campus committees and organizations. The 2013 scholarship award recipient is Judd Case, assistant professor of communication studies. He authored “Logistics of Listening: Acoustic Location and the Extension of National Space,” a groundbreaking study he presented at the annual convention of the International Communication Association in London. For more information about Manchester University and its faculty, visit manchester.edu.